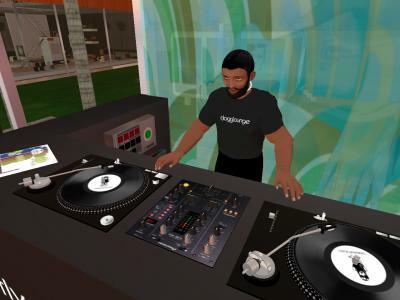 At the Dogglounge, a small, well-appointed, funky-house club, live streams featuring Dogglounge DJs run daily. On weekends, the Dogglounge gets crowded just like any nightclub, and residents dance, chat, and make plans for where else to go. Run by a group of DJs from Minneapolis, the Dogglounge has a RL web presence as an Internet radio site. Once in Second Life, however, the Dogglounge becomes a multi-dimensional entertainment experience where you can listen to DJs, dance virtually (by “touching” special scripts located throughout the club), chat with other avatars in real time, and add a level of interactivity to online communication not possible with now-traditional formats like chat rooms or podcasts.